Target breach: Cyberinsurance is a mess. Why the cyberinsurance industry is a mess. 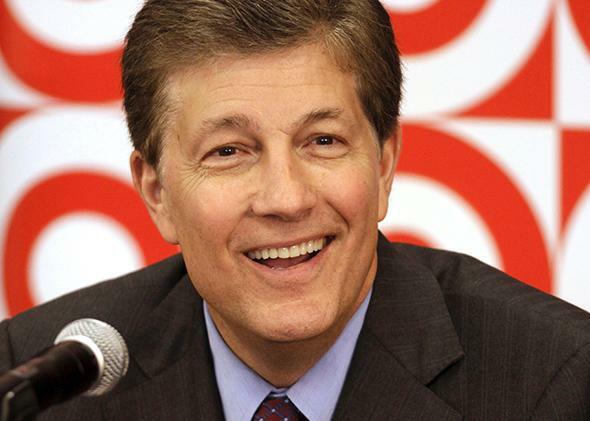 Former Target CEO Gregg Steinhafel in Waukesha, Wisconsin, in 2009. A recent New York Times article touted cyberinsurance as the “fastest-growing niche in the [insurance] industry today.” Nicole Perlroth and Elizabeth Harris report: “[A]fter the breach at Target, its profit was cut nearly in half—down 46 percent over the same period the year before—in large part because the breach scared away its customers.” These enormous costs to brand reputation make it difficult for companies to get as much cyber risk coverage as they want, and the demand is only growing. The Times cites statistics showing a 21 percent increase in demand for cyberinsurance policies from 2012 to 2013, with total premiums reaching $1.3 billion last year and individual companies able to acquire a maximum of roughly $300 million in coverage. I still shop at Target. To calm my nerves, as I swipe my credit card through those ominous red kiosks and picture my card number flying off to Eastern Europe to be counterfeited, I tell myself that a company that was just recently in the news for its poor computer security is likely to now have stronger security in place than just about anyone else. And indeed, the company announced a new program this spring to replace its payment terminals and issue more secure credit cards with chip-and-PIN technology. I think it’s probably true that Target is more security-conscious than most of its competitors at the moment, but it’s also true that, even as someone who spends many of her waking hours thinking about and studying cybersecurity, it doesn’t really guide my personal shopping. When I’m deciding whether to buy a new water bottle or lip balm, I’ll weigh its price, its color, its design—but not the data practice and protections of the seller. Of course, part of the problem is that often I have no way of knowing what those practices and protections are. I like to think that if I had all that information available at my fingertips I would be able to make some judgments about whom to hand my credit card to. But even then, would I really bother? Moral hazard isn’t the only thing cyberinsurers have to worry about—there’s also the interconnected nature of cybersecurity threats. Insurance companies rely on being able to use the fees paid by customers who don’t suffer accidents to cover the costs of those who do. But many computer security risks are not isolated to one victim—a single virus or vulnerability can be used to compromise many targets simultaneously. That’s a serious concern for insurers, who don’t want to be faced with paying out large claims to multiple customers at the same time.